Railroad work has a special place in Greek American lore. There is hardly a Greek American family with roots in the Great Migration of 1880 to 1924 which does not have a story about their ancestors working on the railroads. 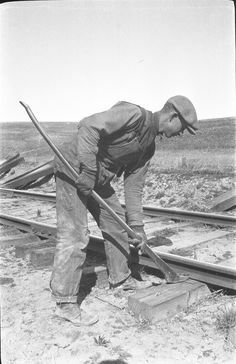 In the late 1880’s up until the end of the First World War, Greek immigrant laborers streamed out to the American West to work in smelters, mines factories, and to help build the country’s everexpanding railroad system. These unsuspecting workingmen were met with hostility. The Greek workers soon learned that the American companies hiring them would take ever opportunity to exploit and cheat them. Organized labor was advocating for new labor laws like the eight-hour workday; basic safety conditions on the job; and fair pay practices. Riots, strikes, lockouts and killings were all commonplace as the workers and the Robber Barons fought over what we accept today as basic rights and conditions in the American workplace. News accounts documenting Greek involvement in these social struggles are readily found. In like measure, one can find news stories attesting to the very reasons why Greeks took direct action to change the conditions of exploitation. If railroad, factory or mining officials discovered that some individual in one of the all-ethnic work gangs knew the rules to the extent that the rest of his crew could not be exploited (when it suited company men to do so), then these workers were immediately fired. Knowing this tendency among the company men helps in understanding a whole series of news accounts where specific individuals were thrown off the job site. Let’s just take two examples from 1907, which was one of the two peak years of Greek migration to the United States, and let’s see if we can determine the reasons why anyone was fired. Individual Greeks were fired which caused the other Greeks to riot. Fine, I understand that. But what the Anglo-Saxon journalists of this era do not seek to investigate (let alone ask) was why these particular Greeks were fired in the first place. Wouldn’t that make the case against the rioters stronger? I’m not saying that the company had no right to hire or fire at will. What I’m saying is that, since no reasons are given here – and are rarely given in any of the accounts I have read, so far – I am left with only one conclusion: The Greeks were fired for reasons which could not be printed in the newspapers. Choose any historical article or book by Helen Zeese Papanikolas, and you will learn that laborprocuring agents were ever at the ready to send as many workers anywhere in the country on a moments notice. One telegram from the rail yard supervisor to, say, Louis Skliris, then known as the “Czar of the Greeks,” and he would have sent as many men as was requested on the soonest train available. Given the bad feelings the riot caused, it would have been even more likely that an entirely different ethnic work gang would have been sent. As Papanikolas has noted in her writings, this practice caused animosity for decades between various ethnic groups in the Intermountain West. Exploitive work practices were one thing, however, death was quite another. I remember meeting Stella Kapetan sometime in 1999 or 2000 at some event hosted by the Hellenic Museum in Chicago. She was more than a tad indignant that no Greek American scholars, including myself, then knew of the Lucin-Cutoff Accident. On February 19, 1904 Kapetan’s great grandfather, Leonidas Maltezos, was killed in the incredibly disastrous Ogden-Lucin Cutoff train wreck on the Southern Pacific Railroad, along with 15 other Greek laborers. In exploring her own family’s history, Stella reminded Greek America of a long forgotten story in our community’s collective history. A total of 24 individuals were killed, and 16 others wounded, as a result of this accident. It’s hard to understand the true magnitude of this collision today. In total, aside from the dead and wounded, “it destroyed seven railcars and the station; left a crater estimated at 50 feet deep; tore up 1,000 feet of track; and toppled dozens of telegraph-line poles. The concussion from the blast shattered windows in a telegraph station more than 30 miles down the line (www.utu.org).” The truly horrific aspect of this event was the fact that many of the dead were literally “blown to bits, with what was left of each man wrapped in a blanket, placed in individual fruit boxes” to be shipped back to Ogden. What is not mentioned in the Greek Star account is that, less than two weeks before this terrible accident, another had occurred at essentially the same location. On January 23, 1904 a rear-end collision at Promontory Point, which is on the Lucin cut-off, three immigrant railroad workers were killed and six injured. Since the reporting American journalists of that time were too fundamentally ignorant to distinguish between an ethnic Greek and other Orthodox Christians, we can not tell who exactly was killed in this dreadful accident. Without question, the Lucin-Cutoff Accident remains a milestone in the history of Greeks in the American west. Yet even this monumental tragedy is but one solitary instance in a long series of railroad calamities in which Greek immigrant workers met their deaths on American soil. These Greek pioneers worked under hellish conditions, now outlawed in general practice. They slaved so that we would not have to endure such harsh conditions. We owe all these men a debt that can never be repaid.